Saboteurs and spies! Con artists, kidnappers, and interstate felons galore! 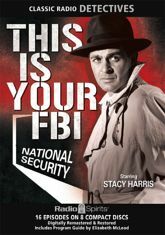 They're all fair game for Special Agent Jim Taylor, steely-eyed G-Man in This Is Your FBI! Produced with the full cooperation of Director J. Edgar Hoover himself, here are sixteen radio dramas of crime and scientific investigation drawn from actual case files! Firm-jawed, firm-voiced Stacy Harris stars as Taylor, cracking down on swindlers and bunco artists, bank robbers and blackmailers, safe crackers, extortionists, and double-crossers with an air of quiet authority.